Slideways Go Karting Australia | Something Huge is Coming to Slideways Go Karting Brisbane! Something Huge is Coming to Slideways Go Karting Brisbane! Home News and updates Something Huge is Coming to Slideways Go Karting Brisbane! Slideways Go Karting Brisbane Renovations are Underway! We’ll be open throughout our biggest ever renovation! 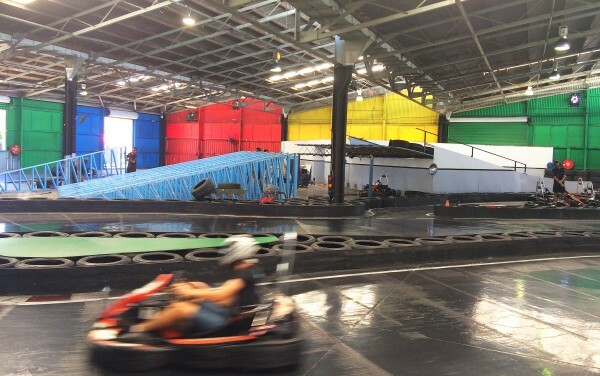 Slideways Go Karting Brisbane is currently in the middle of a massive renovation, with the final product set to create a new benchmark for indoor go karting centres. The venue at 870 Kingsford Smith Drive, Eagle Farm, will remain open throughout the works, with some awesome new features progressively being opened to the public as they become available. Please note that at times we will be running a shortened circuit, but still featuring our full Slideways drift track surface, with our fleet of European made Sodi racing go karts. During busy times, and especially on weekends, we will endeavour to make the track as long as possible around the different construction zones. Do you like our three storey indoor/outdoor race track, Slideways Go Karting Gold Coast at Nerang? Then you will love what we have coming up! The current facility has now been open for four and half years, and in that time has served millions of laps, with a layout that featured a giant cross over bridge. The bridge will be staying, but significantly extended to make an even longer layout. If you love the run down the old bridge towards Kingsford Smith Drive, don’t despair, that won’t be going anywhere! The previous layout saw Cam Wilson set the Guinness World Record for the longest distance travelled at an indoor kart track by a single driver in 24 hours. For the latest updates on construction, make sure you follow Slideways Go Karting Brisbane on Facebook, Twitter or Instagram.